Bus from Kuala Lumpur to Pasir Puteh is the preferred mode of transport among the residents in Pasir Puteh especially for working adults and students who are working or studying in Kuala Lumpur. 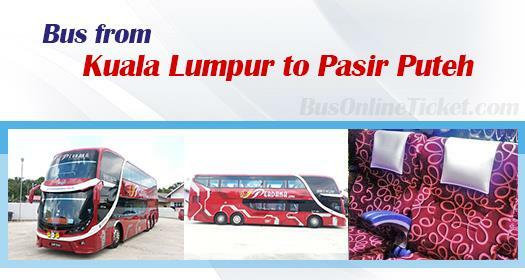 There is no direct flight and train service available for this route, therefore direct bus service becomes their only transport option to go back to their hometown, Pasir Puteh, from Kuala Lumpur. Perdana Express is the one and only bus operator serving bus from Kuala Lumpur to Pasir Puteh. Perdana Express offers up to 9 daily trips from Kuala Lumpur to Pasir Puteh. The first bus service starts as early as 9.45am. Then the following schedule are 10am, 02.30am, 09.30am, and 10pm. Perdana Express will make sure their air-conditioning functioning properly by having regular maintenance. On top of the air conditioning, the spacious bus seat layout allow their passengers having comfortable experience in this long-distance journey. Duration for bus from Kuala Lumpur to Pasir Puteh takes at least 6.5 hours depending on traffic and weather condition on the day of departure. The bus fare from Kuala Lumpur to Pasir Puteh is reasonably charged at RM 44.00. At least 1 stopover will be provided during the journey. Additional break will be given during the journey upon request to driver during the journey. The departure point in Kuala Lumpur is at Terminal Bersepadu Selatan (TBS). Terminal Bersepadu Terminal Selatan (TBS) is a transport hub in Kuala Lumpur. When the bus reaches Pasir Puteh, the bus would terminate at Station Bus Pasir Puteh. In recent years, BusOnlineTicket.com has emerged as the popular transport ticketing portal in Malaysia. Passengers are recommended to book their bus ticket online with BusOnlineTicket.com in advance to avoid disappointment. Visit BusOnlineTicket.com now and purchase your bus ticket through online in anytime, anywhere, and anyplace without waiting in a long queue.